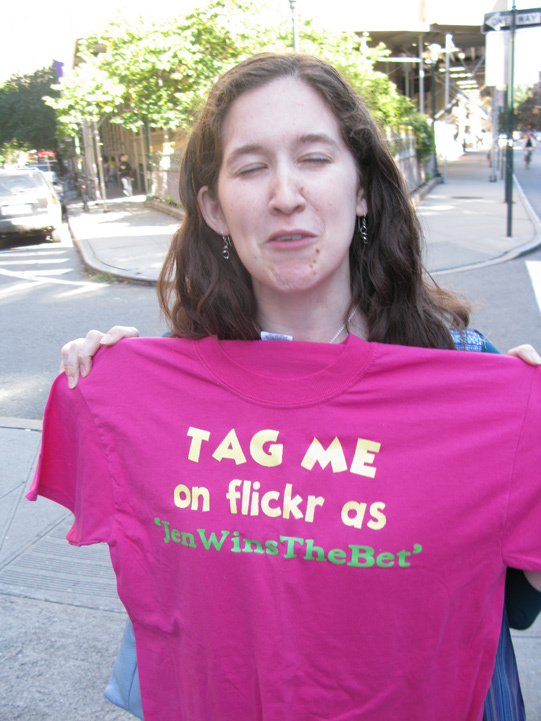 Tag Me On Flickr As… began as a series of bets between Jen Small and Jason Eppink about the number of photographs that would show up on Flickr, the popular photo sharing website, from public spectacles both had attended. The bets were both a criticism and celebration of New York City’s penchant for self-aggrandizing over documentation. The eventual game evolved from spectatorship to participation, complete with custom-made t-shirts. Choose a sure-to-be over photographed happening. Don shirts with the text “Tag me on Flickr as [name]WinsTheBet”. Unsolicited explanations of the bet are not allowed. Players can only explain the game if asked. At the end of a predetermined time period (usually a week), whoever is tagged the most on Flickr wins a free dinner from the loser. The first round of the game was played on September 19, 2009 at People Photographing People Photographing People, a public happening by Newmindspace. Jen won 5 to 0.